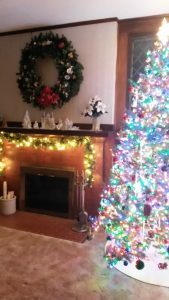 [caption id="attachment_427" align="aligncenter" width="300"] Simple Holiday Enjoyments[/caption] If you’re in need of ideas that will put you in the holiday spirit without having to endure massive amounts of commercialization or hefty price tags, then you’ll want to read on. 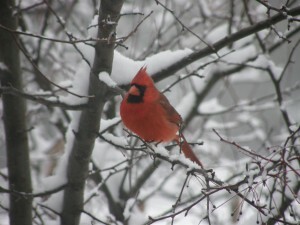 Getting in the holiday spirit needn’t come with an over-the-top price tag or extravagant commitment of time and energy. We asked member inns to submit ideas for holiday doings that we would all do well to experience at least once and the ideas are magical. [caption id="attachment_2123" align="alignright" width="264"] Westport B&B Wine and Roses[/caption] [caption id="attachment_2119" align="alignleft" width="254"] Red Forest Inn Breakfast by Candlelight[/caption] In the Manitowoc area, the “Lights of Lincoln Park” is a beautiful drive-through light show to benefit the local zoo and it’s just $5 per car and runs through Dec. 23. 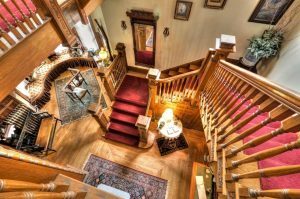 Stay at the beautiful Westport Bed & Breakfast in Manitowoc or the equally beautiful Red Forest B&B in neighboring Two Rivers where you can warm up during their evening wine and cheese hour. [caption id="attachment_2114" align="alignleft" width="271"] Winter at Inn at Wawanissee Point[/caption] [caption id="attachment_2120" align="alignright" width="274"] Ringling House in the Winter[/caption] Take in a classic holiday movie at the historic Al Ringling Theatre in downtown Baraboo – “Holiday Inn” is playing Dec. 20 and “It’s a Wonderful Life” is playing Dec. 22. Ticket price is just $7. This theatre is considered one of America’s prettiest playhouses. Stay at the Ringling House B&B, the original estate of local son Charles Ringling, one of the founders of the Ringling Brothers Circus. This 1901 Colonial Revival Home is on the National Register of Historic Places. The breathtaking views that Inn at Wawanissee Point features are also not far from these holiday events. [caption id="attachment_2110" align="aligncenter" width="191"] The London Room of Astor House[/caption] In Green Bay, marvel at the more than 40 decorated trees on display at the National Railroad Museum during their annual Festival of Trees event now through Jan. 7. Admission is just $5. 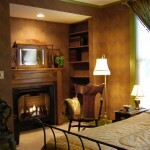 Then retreat to the Astor House B&B where there are five distinctly decorated rooms – ask for the London Room with fireplace. 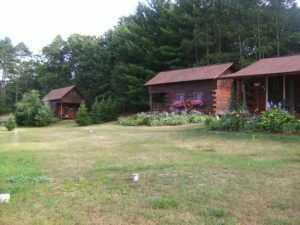 [caption id="attachment_2116" align="alignright" width="205"] Justin Trails Resort Winter Lights[/caption] [caption id="attachment_1672" align="alignleft" width="191"] Grapevine Log Cabins in Sparta[/caption] [caption id="attachment_2122" align="aligncenter" width="143"] Westby House Inn Christmas[/caption] The community of Sparta has its traditional German holiday market known as a Kriskindlemarkt Dec. 8-9 with authentic German food, horse-drawn carriage rides, and artisan vendors. 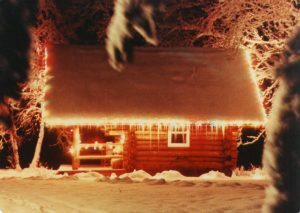 Then cozy up in one of the three log cabins at Grapevine Log Cabins, where towering pines set the holiday scene naturally. 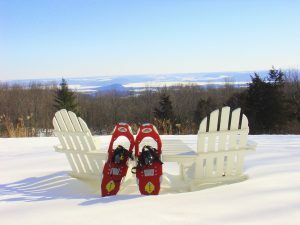 You can also find Justin Trails Resort, which offers cross-country ski and snowshow rentals along with two sledding hills for your outdoor winter fun, and Westby House Inn, where there is something for every vacationer to enjoy, in the Sparta area. [caption id="attachment_2121" align="alignright" width="164"] Sweet Autumn Inn at Christmas[/caption] [caption id="attachment_2113" align="alignleft" width="248"] Fargo Mansion Staircase[/caption] In Lake Mills, get last-minute Christmas shopping done at their annual Winter Market, Dec. 9 where crafters, growers and artists present their treasures. Sweet Autumn Inn will be your spot for the night, where you’ll wake up to a full breakfast feast courtesy of innkeeper Teri Nelson. 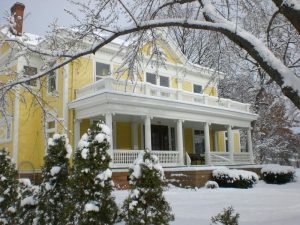 The beautiful Fargo Mansion Inn is also in Lake Mills, where you can "relax, unwind, and make yourself at home". 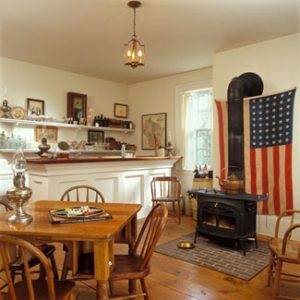 [caption id="attachment_2112" align="alignleft" width="153"] Eagle Centre House Kitchen[/caption] The Old World Christmas event at Old World Wisconsin in Eagle, running the first two weekends of December, comes highly recommended by Eagle Centre House B&B. This “living museum” state historic site will be decked with holiday greenery and there will be horse-drawn rides plus wassail to warm the soul. [caption id="attachment_2115" align="alignright" width="300"] Inn On Lake Wissota Christmas[/caption] In Chippewa Falls, the Christmas Village in Irvine Park running through Jan. 1 is a display of life-size Christmas scenes reminiscent of the Victorian era. 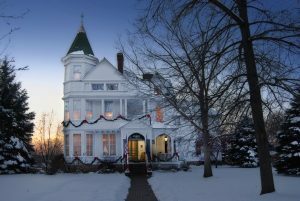 Stay at the Inn On Lake Wissota where visions of sugar plums will surely dance in your heads as you sleep peacefully at this quiet inn tucked away on the shore of the lake. 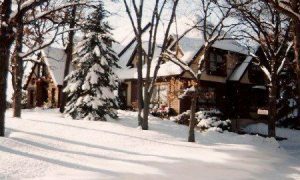 Otter Creek Inn lies in nearby Eau Claire, WI on a one-acre wooded lot that simply glistens with the winter snows. 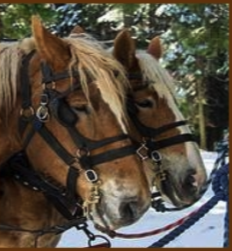 [caption id="attachment_2117" align="alignright" width="300"] Snow-covered Otter Creek Inn[/caption] [caption id="attachment_2108" align="alignleft" width="199"] Hidden Serenity Sleigh Ride[/caption] Take a sleigh ride through the woods lit up by thousands of twinkling lights when you book the horse-drawn sleigh ride package at Hidden Serenity B&B in West Bend. Available on a dozen dates in December and January. 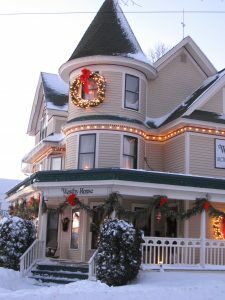 [caption id="attachment_2118" align="aligncenter" width="300"] Phipps Inn Winter Evening[/caption] The Phipps Inn B&B in Hudson, an elegant Victorian mansion, always opens its first floor for tours on the first Friday in December when the Octagon House Museum across the street holds its Victorian Christmas Night from 6-8 pm. Expect a magical night.